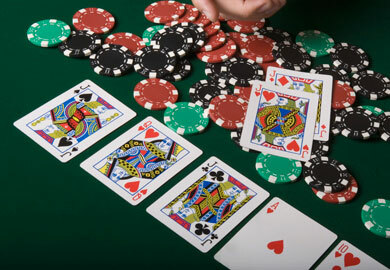 These are tips that are specifically designed for the multihand blackjack game. Multihand black jack gives you five chances to win on every round, and these tips will help you take advantage of that opportunity. – If you are playing in an online casino, no one will be rushing you. Take your time to think about how you want to play each of your five hands. Time to think is one of the great advantages of playing multi-hand blackjack online. – Designate your five hands with different codes (i.e. : H1, H2, H3, H4, and H5). – Employ a different level of aggressiveness for each hand. Operate the hand independently. – Keep one hand as the “no bust” hand. Hold at a hard 16 or above. – Keep one hand as a super-aggressive hand. Only hold at 20 or 21. – Consider all Aces to have a value of one unless the hand equals twenty-one when the ace is counted as eleven. – Take out insurance on some or all hands when the dealer is showing a face. – Split any hand with two face cards. – Play every hand to win. There is no rule against winning five times in one round if you play the cards right. – Set time limits to your playing time and stick to them, especially if you are way ahead. Remember that probability-wise almost all gains and all losses will even out over time. – Record what strategies you use and what the results are on paper. After several hundred rounds, you will start to see patterns. Use the information to refine your multi-hand black jack strategies. What is Camouflage Blackjack Strategy?